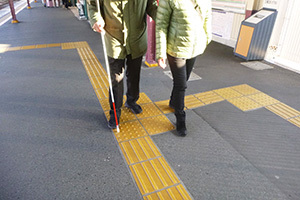 Japanese accessibility often requires assistance. For example, train station staff will assist wheelchair users to get onto trains and subways. The service is free. If you'd like to ask for assistance, ask station staff. Tell them if you don't need assistance. Most local buses in Tokyo are low-floor buses. However, unlike western countries, the ramp is not automatic. 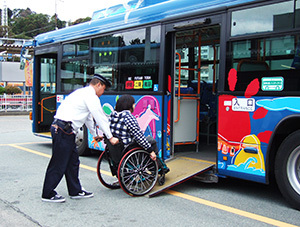 The driver will prepare the ramp manually and help you get onto the bus. Unlike most western countries, the accessible restroom stall is not located in each restroom for men and women. Multi-purpose restroom is a restroom for people with special needs such as physical disabilities, a wheelchair user, people with an injury, people with stoma, pregnant women, people with babies, elderly persons, etc. It is a guide for people with visual impairment. There are two types of tile. One has dots and the other has lines. The one with dots means "stop". The one with lines means "go". A person with visual impairment can follow the lines with his or her foot and/or white walking stick. These braille block tiles are on most side walks and on the floors of most public buildings. 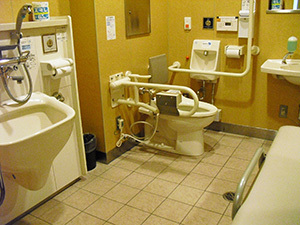 In Japan, criteria for accessible facilities and/or equipment is according to Japanese "Barrier-Free size" (measurement). However, this "Barrier-Free size" may be smaller than the "Barrier-Free size" you are accustomed to. For example the "Barrier-Free size" of elevator doors is 80cm which is too small for a large wheelchair. In Japan everything is smaller compared to western countries. For example, taxi cab trunks are quite small. Rigid wheelchair might not fit in the trunk. In a train, the wheelchair user is asked to fold the wheelchair after transferring to the train seat since the aisle is narrow. We recommend you come to Japan with a folding wheelchair. Having detachable rear wheels makes things much easier for wheelchair users. The voltage in Japan is 100v. Most powerchair battery chargers, PCs, etc. are universal. However, please check the voltage of your electrical products before traveling to Japan.